As the end of my third and final year in New York City nears, I’m realizing just how much I’ve learned. When I first moved to the City, I was a wide-eyed tourist and I had a lot to figure out. Now, for better or for worse, I feel like a real New Yorker. Reaching this point has been a long process, and if it weren’t for these New York City hacks that I’ve come to know, I wouldn’t be who I am today. So take it from me, here are the do’s and don’ts for your trip to New York. #1 Do get Halal Guys after a night out. I know I’ve said this before, but you must eat Halal Guys! I’m not saying you need to have it everyday, but to go out for the night, and to not have Halal Guys at least once, is basically a crime. $6 is all you need to pay for a mountain of awesomeness that hails from the Middle East. Extra hot sauce and extra white sauce is crucial, so don’t mess that up, either. Halal Guys is the best 2 a.m. drunk meal you’ll find, and it’ll be one of your best New York City hacks from here on out! #2 Do expect the Subway to be delayed. This has been the one constant during my three years in New York City. You can never expect the subway to be on time. You’re actually more likely to encounter aliens, get attacked by a shark, or win the lottery. If you’re somehow lucky enough to not be delayed at all, please let me know. I want to hear all about your perfect subway ride. Just kidding, I wouldn’t believe you anyway. My advice to you is to add five minutes to every ten minutes you expect to be on the subway. In other words, if you’re only supposed to be on for twenty minutes, in reality you can expect a thirty minute ride. This is golden advice; you should put it on a plaque or something. #3 Do prepare for the winter wind. It’s been a relatively mild winter, but even mild winters bring bone-chilling winds that’ll have you wondering why you ever chose to come here in the first place. This is one of the most important New York City hacks, since we’re talking about your livelihood here. You must bundle up and prepare for the elements! It might be a relatively warm day, at 45 degrees Fahrenheit (7 degrees Celsius), but the wind will bring that down to 25 degrees Fahrenheit (-4 degrees Celsius) faster than you could imagine. #4 Do shop at sample sales! This is the best of the New York City hacks when it comes to shopping. Obviously, you’re in one of the fashion and retail capitals of the world. This means that brands are trying to test out future products or get rid of past merchandise in this diverse city. I happen to work (occasionally) at the best one in the city: 260 Sample Sale. This store has a new brand every single week and operates in up to 3 locations. Here, you can find brands such as J. Crew, Asics, The Kooples, Sandro, Derek Lam, Rebecca Minkoff, and plenty more at up to 90% off retail prices. You’re welcome! #5 Do visit other boroughs. Some people don’t even know that New York City is more than just Manhattan; there’s also Brooklyn, Queens, the Bronx, and Staten Island. All of these are their own cities and counties, but also make up New York City. I know, it’s confusing, but just know that they all come together. A big mistake that many people make is not leaving Manhattan, and it’s honestly a travesty. The other boroughs – especially Brooklyn and Queens – have so much to offer, that you need to get out and explore! #1 Don’t expect to find a public restroom when you need one. This has happened to me and everyone I know multiple times. You can’t rely on public restrooms because they’re usually dirty, you have to pay, or they’re just inaccessible. But of course there are New York City hacks to this: look up apps that tell you where public restrooms are or simply use the ones at the restaurants you dine in. #2 Don’t shop on Fifth Avenue. If you shop on Fifth Avenue, you’ll be sure to find a few things: retail conglomerates, waves of people, and zero authenticity. When you come to New York, you need to demand more than that from one of the world’s fashion capitals! Go to the aforementioned sample sales, shop in SoHo, or go scavenging for original pieces in the Village or Williamsburg instead. You’ll be much happier, and your wallet will be, too! New York City cabs are pricy, the drivers aren’t the best, and customer service is terrible. Instead, some New York City hacks would be to take Uber or Lyft, take the subway, or (my personal favorite) take the Citi Bikes which can be found at various locations. Biking is a great way to see the City more intimately and be environmentally conscious at the same time! #4 Don’t eat at restaurant chains. You’re in one of the culinary capitals of the world, so I beg you to not eat at chain restaurants during your whole time here. No Starbucks, Chipotle, McDonald’s, or anything else that can be found around the world or the country. I will personally send you a list of my favorite restaurants at all different prices if you promise me to stay away from chains while you’re here. Please and thank you. #5 Don’t buy cheap souvenirs. For many, it’s hard not to buy that “I heart New York” sweatshirt, a Statue of Liberty snow globe, or a mini replica of the Empire State Building. Instead find something, outside of Midtown, that you actually like and that will last you much longer. I promise you that an authentic piece of New York City will make your memory of this great place that much better. Don’t buy any of the cheap stuff; it’ll probably break on your flight home! Over to you! What are your favorite New York City hacks? Are you guilty of any of these New York City Don’ts? Heh, I can’t imagine going to a place like that and going to McDonald’s. That would be silly. Great stuff. Thank you for sharing! Right?! Yet people do it ALL THE TIME! I did take the cab in NYC though ….. but one of my principe is to NEVER eat in a chain restaurant when I’m abroad (okkkkk shake shack and in n out burger doesn’t count I don’t have them in my country). I was also really surprised by the cold in NYC the time I went there in february ! 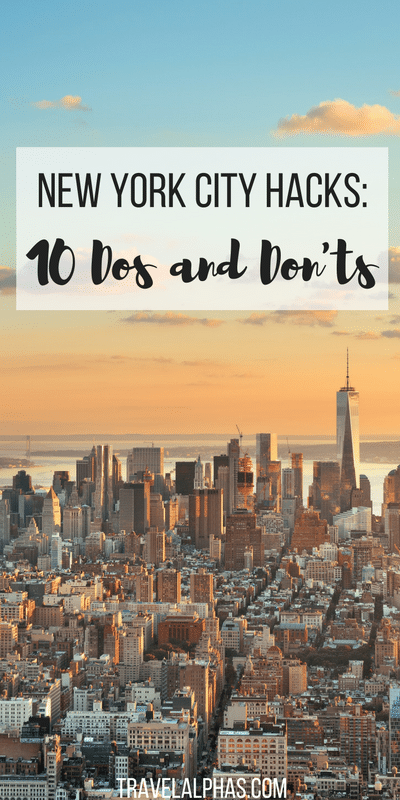 This is such a great list of Dos and Don’ts for NYC! I love the one about not eating at chains because there are so many wonderful restaurants in NYC! They actually just opened a Halal Guys in Houston, and I can’t wait to try it out! I swear by so many of these tips! We went to NYC a few months ago and didn’t eat at a chain once!! That’s how I we found so many amazing restaurants. The subways actually weren’t too bad but we weren’t on a tight schedule. I love this post!! Right?! Well, if you’re not on a tight schedule to get to work, class, a dinner reservation, etc., then no big deal! There are waaaay too many incredible restaurants in NYC to eat at chains!! Great suggestions. What are your thoughts on hotels? Last time I was there I booked this hotel downtown that was close to everything and it turned out to be the most horrible decision ever! I just don’t feel like I can trust New York to be very nice to visitors. Yeah… We’d recommend staying in Williamsburg or SoHo! I definitely would agree on all on making sure you visit the other boroughs – you get a better slice of local life! Haha, well I’m definitely guilty of taking cabs;-) But totally agree with these hacks, and would also add a big “do” for locals: take advantage of all the free stuff the city has to offer! I just got my NYCID in the mail, and can’t WAIT to check out so many museums for free that I’ve never been too! We’re currently working on a guide to NYC ebook that will include all of our favorite free things to do!! Can’t wait to read about all those museums on your site!! This is such a great post! There have been a few times where I had trouble finding a public washroom to use while walking around NYC. I have had good luck finding a bathroom in hotel lobbys — and sometimes they have free water available in the lobby too. I’ll have to try Halal Guys next time I’m visiting. And do not buy cheap umbrella’s on the street, unless you will need it just to come across that street. Haha! And that probably goes for anywhere, not just NYC! I would love to visit New York someday and do some of these do’s – and probably some of the donts too – like eating at iHop or Taco Bell … Also I think a lot of people go to McDonalds just to see the sizes. For us, that’s not a good enough reason to go to McDonald’s… There’s actually never a good reason. But we can see why people from other countries would find the portions interesting! Oh man! The Halal guys looks so so delicious!!!! I need to get back to NYC! I’m heading to NYC later this year, how I’d love that list of your favourite NYC eats! Definitely going to check out the sample sale link as well, I’m well and truly prepare to shop my little heart out in NY. We’ve found Uber and Lyft to usually be around the same prices, give or take a few cents. Totally agree with you though; Brooklyn and certain parts of Queens shouldn’t be missed! I’m surprising my super theater/drama/TV daughter with a trip to NYC for her sweet 16!!! I need all the help I can get bc I’ve never been there. I’ve read your blogs but any tips for food and drink ( we are foodies too), local music venues, “real shopping ( ie no 5th ave) etc would be greatly appreciated ! We only get 3.5 days ! Sounds great. We have written a ton of posts about NYC on this website, so feel free to have a look around. Love this list and your thoughts… I am taking my 13 year old daughter for a long weekend. We.are staying at the Marriott Times Square and so far we have tickets to Book of Mormons & Moma (skip the line pass) with plans to go to Chelsea & Soho for shopping and walking… restaurant ideas near Times Square ? Not touristy… also in Soho. She is fashion design conscious… we will hit the sample sales. My best-friends and I are going to New York in January. One is really into Harry Potter and is going for a Broadway show but we will be there from the 18th – to the 22nd so I’m browsing your blog for ideas. I started an itinerary but it is really nice to know the do’s and don’ts. We also started our own blog last month. I am so not ready for the cold.